After the disciples gathered to Jesus, they told him about what they had done and what they taught the people. Then Jesus said to his disciples, “Let us retreat to a solitary place where we can have some rest for a while.” So they departed to the place with a boat by themselves. But the people saw him, and when they found out that he was retreating to a solitary place with His disciples, they ran to the place and arrived there before Him. When Jesus arrives, He saw the multitudes and had compassion on them. So Jesus began to teach the people many things until evening. It was getting dark, and the people were with Jesus the whole day and haven’t eaten anything. Then Jesus made the people to sit down in rows of fifties and hundreds. After Jesus took the bread and the fishes, He looked up into heaven and thank God. Then He gave them to the disciples. 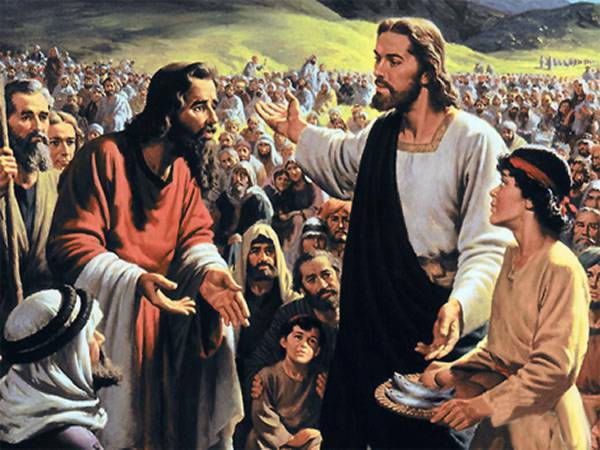 His disciples then distribute the five loaves of bread and two small fishes among the people. So everyone ate and felt satisfied and there were leftovers. The disciples collected all the leftovers and it filled up twelve baskets. The people who had eaten the loaves are 5000 not including the women and children.